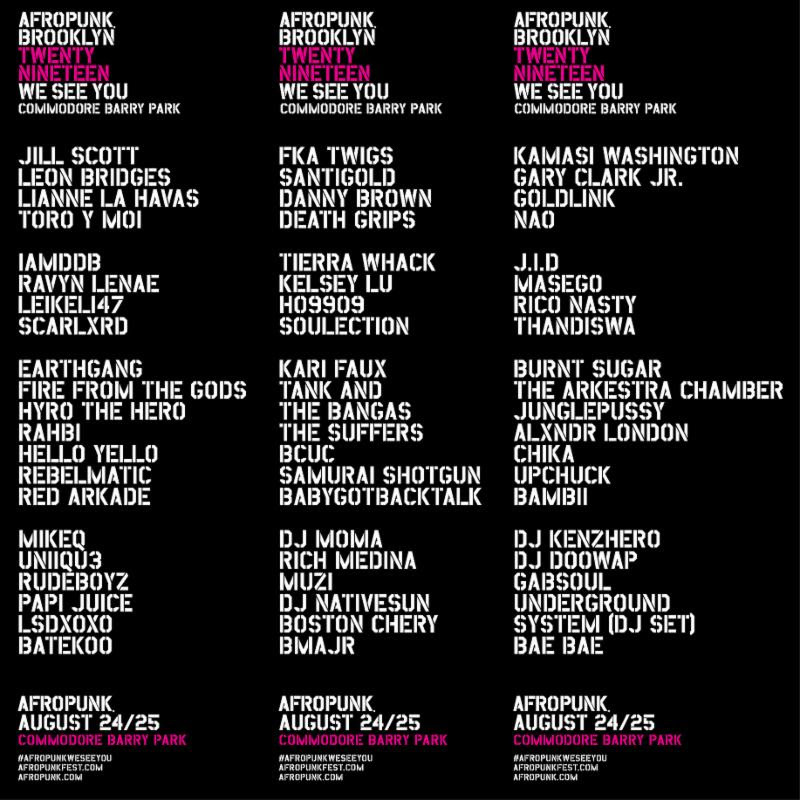 AFROPUNK, the world-renowned festival and movement, has announced the lineup for its critically acclaimed, weekend-long, annual celebration, AFROPUNK BROOKLYN, which will take place on August 24 and 25 at Commodore Barry Park in Brooklyn, NY. AFROPUNK BROOKLYN’s 2019 edition continues to display one of the most exciting and inclusive festival lineups in the world. Headlining the festival this year are Jill Scott, FKA Twigs and Kamasi Washington; with additional performances by Gary Clark Jr. Santigold, Lianne La Havas, Danny Brown. Toro Y Moi, Death Grips, J.I.D, Leikeli47, Rico Nasty, Tierra Whack, IMDDB and many others (full lineup below). The festival has expanded around the world in five cities, Paris, Johannesburg, London and Atlanta, with additional cities on the horizon. Beyond the constellation of large-scale, live-music events, AFROPUNK is a world-wide community that is the engine of the global Black experience. AFROPUNK festivals are gathering places to experience art, food and craft-makers and vendors. AFROPUNK is where the global majority comes to see and be seen, to speak loudly and proudly, to resist and party – but most of all, to make the future. As has become custom, AFROPUNK has created an annual theme for the festivals: this year, it’s WE SEE YOU, a message that brings together AFROPUNK ideology and the people who support it, under the banner of acknowledgment, in resistance to those who strive to oppress.